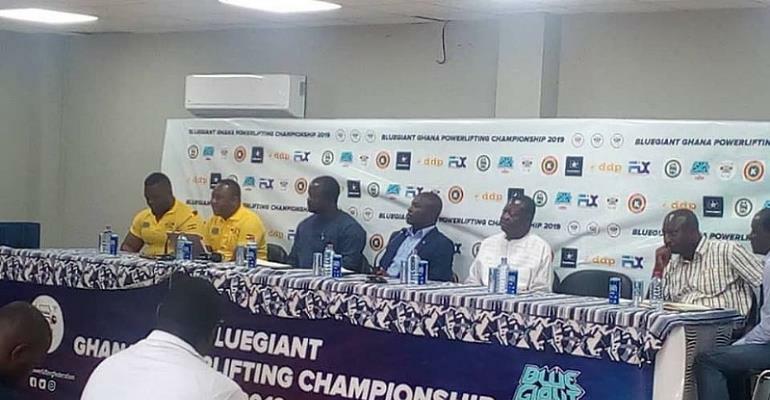 The 2019 Blue Giant Ghana PowerLifting Championship will be held at Manste Agbona, James Town in Accra from April 26thto 28, 2019. At the launch of the event, Mr. Gudwill Agyeman, president of the Ghana PowerLifting Federation thanked Budget Cash & Carry Ltd for coming on board as the major sponsor. He said Ghana boast of Africa’s champion in the person of Eben Nii Armah who deserves recognition and reward from the media for working hard to put Ghana’s name high. He said the event will be held at the ancient city of James Town to draw tourist and give the people some entertainment. He said the programme will begin on April 26 and end on April 28, 2019, with a handsome sum of 5,000ghc at stake for the overall winner. Professor Peter Twumasi, Director General of the National Sports Authority (NSA) who represented the Minister of Youth & Sports, Hon. Isaac Asiamah and launched the event commended the executives of the PowerLifting Federation for coming up with the Championship that will keep the strong men busy preparing and participating. He said sports does a lot for the nation aside the health benefits and urged other companies to support sports in Ghana. Nana Egyiri Aggrey, CEO of Budget Cash & Carry, distributors of Blue Giant Energy Drinks said he is committed to developing and supporting sportsmen and women, so he has brought in Blue Giant which contains Branched Amino Acids which is good for sports people, especially bodybuilders and powerlifters. Eben Nii Armah, the national and African Champion in a message advised athletes to desist from hard drugs like Tramadol and use food supplements. He said the best juju is training and discipline, which has taken him to where is currently. Champion Dishes at Adabraka in Accra refreshed some members of the media and guests after the launch.